My post on biscuits starts by introducing the Chinese word binggan as umbrella term for a range of biscuit-like products. The word doulei, literally: ‘types of beans’, is a similar term. The major subcategory is the soybean, but it also includes all other types of beans, as well as peas. This is partly dictated by the structure of the Chinese vocabulary. Chinese knows many families of words that are di- or trisyllabic, in which the final syllable refers to a general category. In this case dou means ‘bean’, but because pea is wandou in Chinese, peas are regarded as a subtype of dou (beans). Wan by itself also means pea in Ancient Chinese, which was a highly monosyllabic language. Beans themselves are regarded as a subtype of the umbrella term zhushi, ‘staple food’, together with the various cereals and tubers. As a consequence, beans are perceived as a strategic product. A bad harvest does not only harm the farmers, but also the food safety of the nation. You do not want the supply of staple foods in your country to rely too much on imports, as that would make you vulnerable for boycotts. Still, the Chinese demand for soybeans still relies for 80% on imports. The following table (unit: 10,000 mt), listing the national and regional production of beans in 2012 and 2017, shows that the national output has not grown that much over the years. In fact, it has gone up and down, with a slight long-term growth. The regional situation, on the other hand, shows big changes in both directions. Insiders expect considerable growth in the coming years and estimate that the output of 2019 will be 21.94 billion mt. The growing area for bean products in China was 10.051 hectares in 2017. Chinese national statistics regarding the food industry are usually focused on so called ‘enterprises of a certain scope’. In practice, it refers to the entire industry, minus small household or workshop-like enterprises. The total turnover of the industry has increased from RMB 59.5 billion in 2013 to RMB 99 billion in 2017. The number bean processing companies of a certain scope in China was 4890 in 2017. The total profit of the industry increased from RMB 3.6 billion in 2013 to RMB 5.5 billion in 2017. Insiders estimate that it will further rise to RMB 6.5 in 2019. China’s 2018 soybean imports were 7.9% lower than in 2017 according to statistics from Chinese customs released in January 2019 – the first drop since 2011. Fuelled by strong domestic demand for food oil and animal feed, China’s soybean imports have grown rapidly from 30 mln mt in 2007 to 95 mln in 2017. But the ongoing trade war with the US, which is the largest source of imported soybean, disrupted that trend. China has turned toward other suppliers such as Brazil, while also exploring technological solutions (such as soybean substitutes in animal feed) to reduce reliance on imports. You can make many products from beans. I will concentrate on the more typically Chinese types in this post. The Chinese perception discerns two main types of bean products: fermented and non-fermented. Ferment bean products included furu, cubes of bean curd fermented with a red mould (see my earlier post on furu in this blog) and douban, spicy fermentend bean curd, also introduced in an earlier post. Another well-known type if douchi, a black fermented paste that is best known from its frequent use in Cantonese cuisine, e.g. douchi chicken. Soybeans are also a major ingredient in soy sauce. 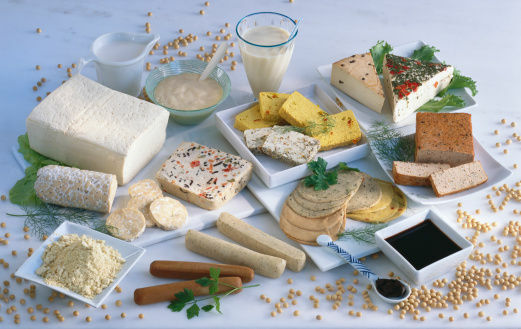 Better known nonfermented products include: bean milk, bean strips, bean curd, dried bean curd, etc. A product that deserves to be mentioned specially is soybean milk (dounai). 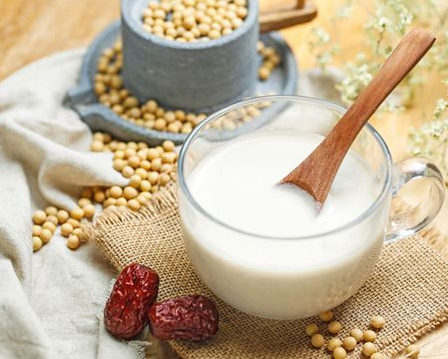 While the regular soy milk (doujiang) is a by-product of bean processing, soybean milk is a beverage with a higher protein content, developed as an alternative for milk. Many Chinese still have a problem with the creamy taste of milk and prefer to drink soybean milk as an alternative. With the recently increased interest in protein beverages (see my special post on that product group), soybean milk has become a product of focal interest. Another trend that benefits the bean processing industry is the growing interest in vegetarian food. 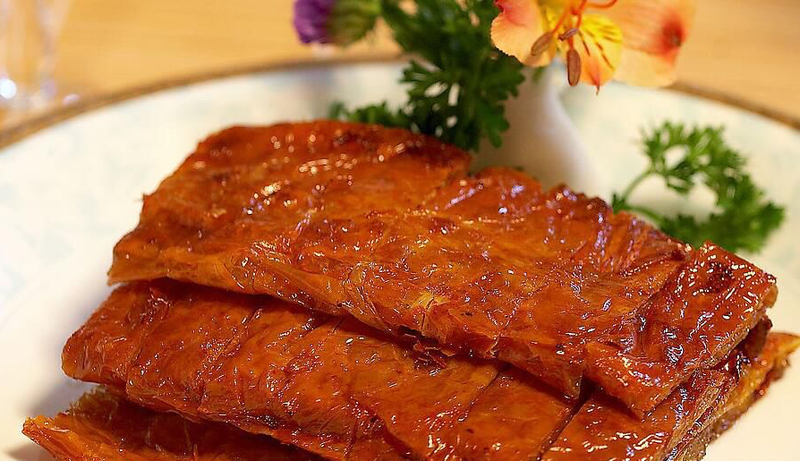 Bean protein is the first alternative for animal protein, so many Chinese food technologists are busy formulating bean-based artificial meat products. 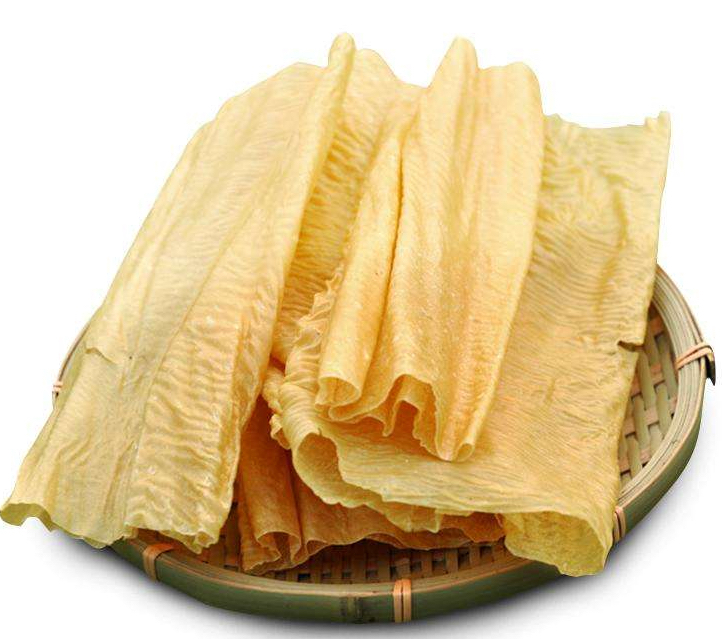 These two pictures show a traditional product: doupi or dried bean curd skins, and vegetarian roast goose made from doupi. Now that this post has been added to the blog, I will regular update it with the latest bean-related news and information. A host of food ingredients can be made from beans. Most of these have in common that they add (vegetable) protein to foods. Bean-based ingredients are even added to meat products. An example can be found in my post on the typology of meat in China, where bean powder is added to a variety of meat floss.